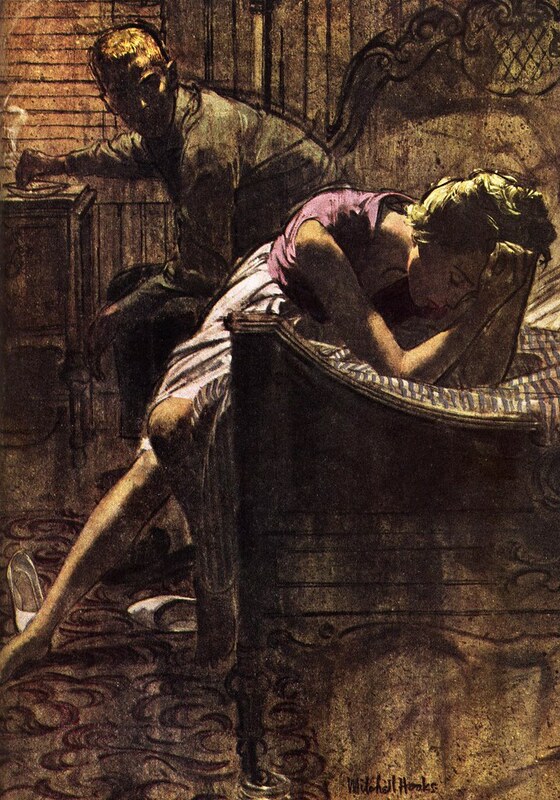 Today's Inspiration: Mitchell Hooks: The 'Slicks' - at Last! Mitchell Hooks: The 'Slicks' - at Last! 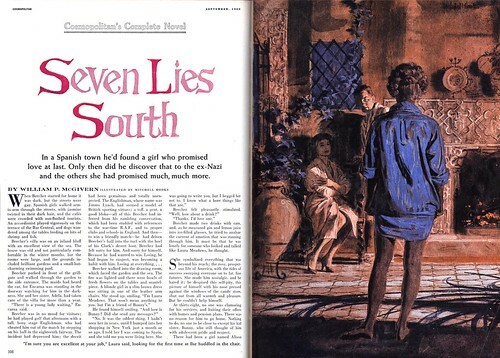 When Mitchell Hooks was just a teenager at CAS Technical High School in Detroit he'd pour through the pages of the Saturday Evening Post and dream about the day when his work might appear in those pages, above the credit line "Illustrated by..."
Coming to New York and working in one of the top commercial art studios didn't make that dream a reality. 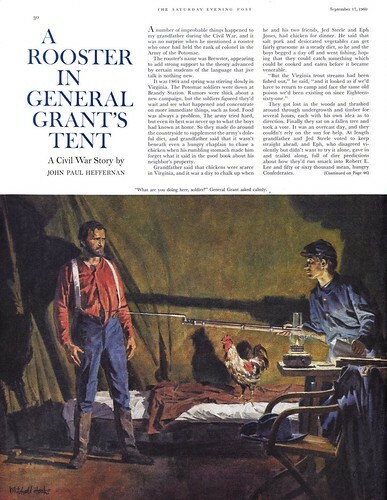 His work was competent enough... but as he told me when we talked about his first years in New York, "The city was teeming with illustrators, which was fine, because the magazines were packed from cover to cover with illustrations - story and advertising." But in that superheated marketplace, Mitch was just one more illustrator working in a literal style, jockeying for position against dozens of other, better established competitors. By blazing a trail in book cover illustration instead of following in the footsteps of others, Mitch was at last noticed by the magazine art directors. 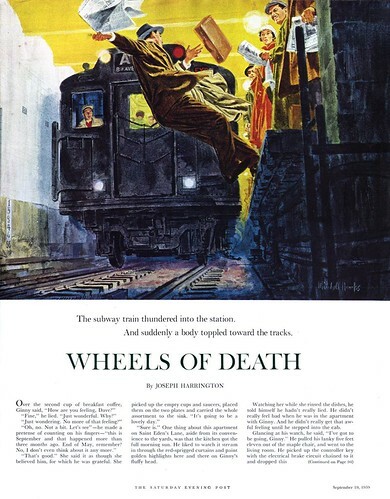 In the late 50's, his work began appearing in the pages of The Saturday Evening Post. It wasn't everything he'd hoped for. When I asked him about working for the The Post, surely the pinnacle of achievement for any illustrator in the 50's, his response was less than enthusiastic. "They paid very poorly, considering their stature. About $300 for a full page illustration - the same as what I was getting for a paperback cover. And they acted like you should be honoured they'd chosen you." While Mitch's Post work is always top notch and eye catching, I suggested to him that, compared to what he was doing elsewhere, it seemed a bit... restrained. "That's an astute observation," he replied. "They didn't encourage too much experimentation at The Post. They'd say, 'Remember, we're a family magazine.' "
I also mentioned that I'd found advertising art from around the time he began doing magazine illustration - something I hadn't seen earlier on. 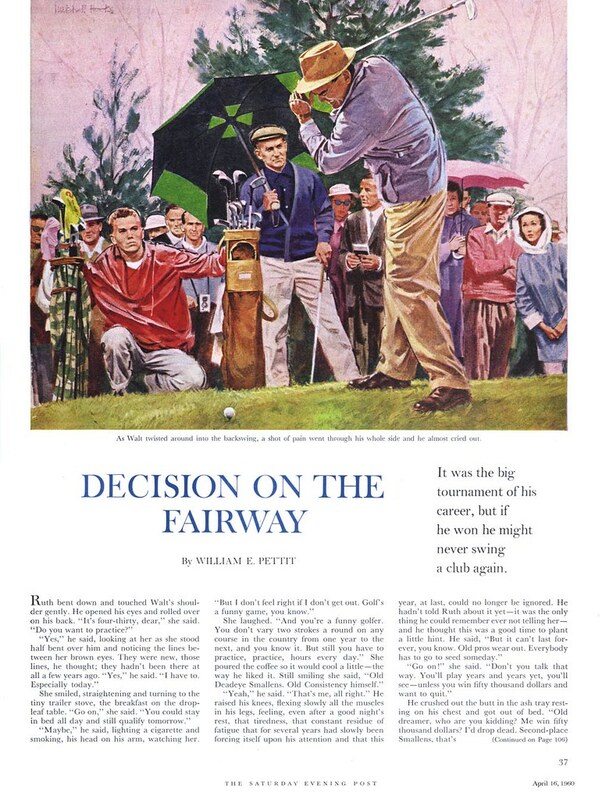 I suspect that the strategy Charles E. Cooper had employed throughout the 50's - encourage your artists to do plenty of high-profile editorial art because it brings them to the attention of advertisers - was working for Mitch as well. I asked him if it would be fair to say that ad art paid as much as ten times what the editorial did, and he said that sounded about right. For Atherton, Mitch reserves the highest praise: "Of a handful of truly exceptional art directors I've worked with in my career," says Mitch, "Atherton was the tops. He was an aesthete." I talk about how I've noticed that many of the same artists who did fine work for The Post seem to have pushed themselves much further when working for Atherton at Cosmo... that their work - and Mitch's as well, seems much more experimental and energized. Mitch concurs and says, "Atherton insisted upon it." "In fact, he rejected one early assignment I turned in, saying I could do better... take it farther." In his interview in American Artist from 1960, Mitch said, "The magazine art directors I work with encourage invention and personal expression. I find that this freedom usually stimulates work and results in a picture that pleases the artist as well as the art director. He is happy to have art that is not an imitation of the current popular 'School of Illustration' ." Considering the time of that interview, I can only imagine that Mitch was talking about Robert C. Atherton. Just compare these pieces for Cosmo with the ones above for The Post, all done around the same time, and the conviction of his words becomes self-evident. I ask Mitch how long he worked for Cosmo and he says, "Not very long... I don't know why they stopped calling me, but it was only a few years." 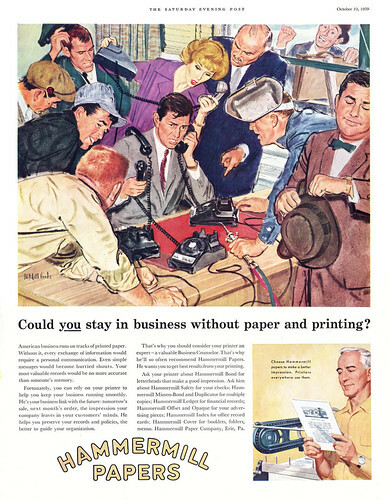 I suggest it was the times: that period around 1960 when all the magazines began drastically cutting back on illustration -- and when many artists left New York in search of greener pastures. Mitch agrees, saying, "Luckily for me I had my book covers to fall back on. You know, I'd always looked down on paperbacks, but when times got tough for everyone, I had plenty of work, thanks to them." As well, a new, exciting and lucrative market was emerging for Mitch. 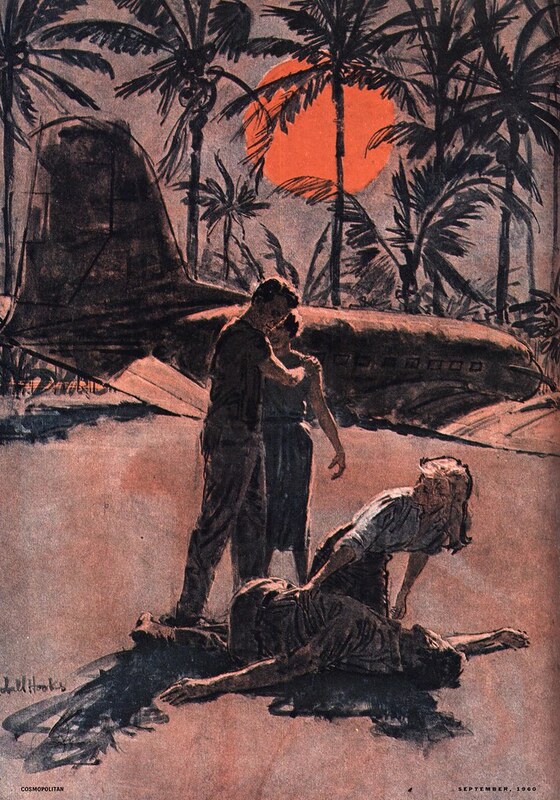 My Mitchell Hooks Flickr set.